The Alaska Entomological Society invites members of the Alaska Entomological Society to submit a proposal to the annual Kenelm W. Philip Entomology Research Award. Kenelm Philip (1931-2014) was a radio astronomer with a B.S., M.S., and Ph.D. from Yale. He moved to Alaska in 1965 and became an associate professor at the University of Alaska Fairbanks. 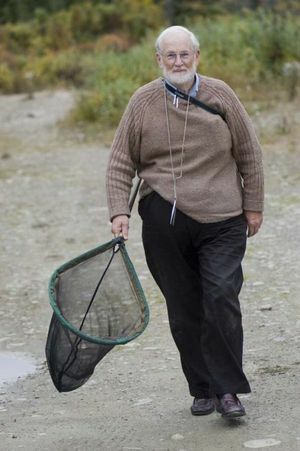 In 1970 Ken established the Alaska Lepidoptera Survey (ALS), which included over 600 volunteers who helped collect Lepidoptera, primarily butterflies, from around the state. Between 1965 and 2014 Ken was dedicated to documenting the butterfly fauna of Alaska, western Canada and eastern Russia. He amassed the world’s largest private collection of Arctic butterflies (78,240 butterfly specimens). His entire collection, which included specimens from around the world and some non-butterflies, had reached 127,973 specimens by 2014. To honor his legacy of documenting the lesser known animals of Alaska, the Philip family established the Kenelm Winslow Philip Entomology Fund which is managed by the University of Alaska Foundation and dedicated to the support of the University of Alaska Museum Insect Collection. This award from the Kenelm Winslow Philip Entomology Fund promotes Ken’s legacy and supports the missions of the University of Alaska Museum Insect Collection and the Alaska Entomological Society. See the award announcement for more details.